The wireless outdoor repeater supports three modes: WISP mode; AP Mode; Router mode. 360°wide signal coverage and high-end chip makes it a budget-friendly item but with amazing performance. It is definitely great for outdoor wireless signal transmission. Use ABS shell; wind and rain-proof interface. IP65 dust and water proof level; 15KV ESD and 4000V anti-thunder design stands terrible outdoor environments. 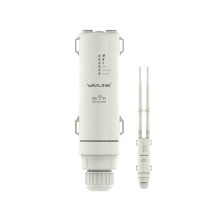 Two 7dBi omnidirectional antenna ensures 360°signal receiving and transmitting. Wide signal coverage makes it an ideal choice to use in village, school, park, port and factory.etc. Matching with 32Mb flash storage, 512Mb storage, the premium chip supports multiple devices synchronous connection and ensures the device would run smoothly. Support Passive POE power supply. With POE adapter, power supply and data transmission can be done concurrently. Network card power supply distance can reach to 60m. It is not difficult anymore to have power outdoor. Flexible stationing is also available. Support WPA-PSK/WPA2-PSK encryption. Effectively ensures safe data transmission.